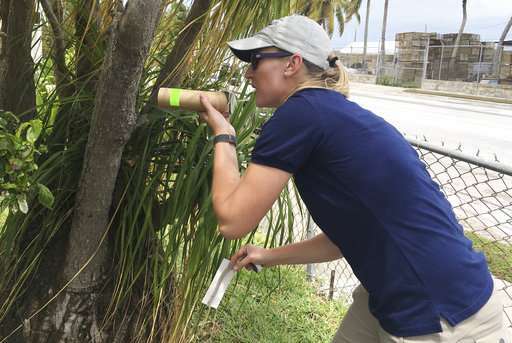 The Keys trial is MosquitoMate's second U.S. test with Aedes aegypti mosquitoes, after a similar trial in Clovis, California, last year. Stock Island is about 130 miles southwest of Miami, where Aedes aegypti mosquitoes were blamed for spreading the Zika virus last year. "We're looking at these sterile insect techniques because our conventional mosquito control methods are costly and labor-intensive," Leal said. 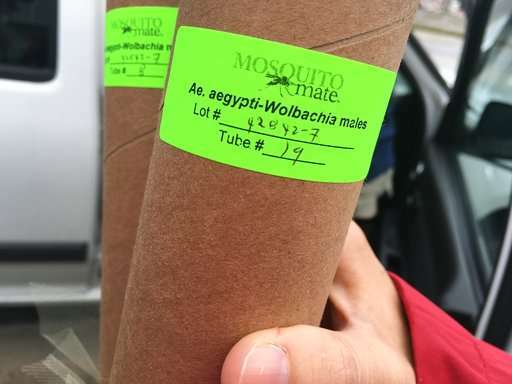 MosquitoMate is awaiting permits from the U.S. Environmental Protection Agency to sell a related mosquito species, known as the "Asian tiger mosquito," infected with Wolbachia as a pest control service. Though these mosquitoes also can carry viruses, experts consider them less of a threat for triggering outbreaks than Aedes aegypti. Currently, genetically engineering mosquitoes, as Oxitec does, is regulated by the FDA, while modifying mosquitoes through other techniques, such as MosquitoMate's bacteria, fall under the EPA as pesticides. Oxitec has publicly supported regulatory changes that would expedite review of its mosquitoes "in light of the ongoing Zika-related public health emergency." It has asked both agencies to clarify how marketing claims would differentiate between suppressing mosquito populations and stopping diseases, "particularly where the vector control product is pesticidal in its action to suppress mosquitoes that transmit human disease." Dobson said he hopes the regulatory issues will be resolved quickly, so that mosquito controllers will have more tools to keep the viruses carried by invasive mosquito species from spreading, and more flexibility to address the public's concerns about human health. "It might be in some places that people will say, 'We don't want Wolbachia,' or they'll say, 'We don't want GMO,' or they'll say, 'We don't want planes spraying overhead,'" Dobson said.